Face to Face was created in 2012 by Emily Robinson. Inspired by Emily’s passion for science, Face to Face offers a spa experience with a strong understanding of the biology and chemistry behind the services offered. The goal at Face to Face is to not only relax the clients, but also offer them a better understanding of their skin and muscular system. Education is the key to health and beauty. Emily Robinson’s first love was the study of science and nutrition, and she earned her college degree in general physical science before branching off into various other fields of endeavor. After college, Emily returned to school to become a licensed massage therapist. Emily then spent four years in New York working in the business end of the Fashion Industry, but felt pulled back to health-related service industries and California. She earned her certification in nutrition and worked as a nutrition counselor at a fitness center before returning to school to become an esthetician. Emily continues to increase her knowledge and training by regularly attending courses to stay current in “skin” and “massage” science. Emily brings fresh energy and a myriad of skills to her business. Her natural warmth and genuine concern for each of her clients is evident in the personal attention she gives to each treatment. Emily treats skin care holistically, incorporating nutrition and lifestyle awareness as part of a healthy skin care program. Schedule an appointment with Emily for relaxing and rejuvenating treatments that will send you out to FACE the world with confidence and vigor. Emily is available Tuesday, Wednesday, Friday and Saturday. Beginning May 1st, Emily will not be taking any new clients except for consultations. Ashley Cohen is a Licensed Esthetician and Professional Makeup Artist. Ashley started her career in Makeup Artistry in 2008 in Los Angeles and then completed her Esthetics education in 2016 here locally on the central coast . Driven by her passion for skincare she strives to give each client the results they are seeking, while promoting deep relaxation. She is known for her thorough extractions, chemical peels and exceptional waxing services. Sanitation and quality are her main priorities when it comes to her work. Ashley continues to make learning and growing a top priority by furthering her knowledge attending advanced education classes and professional trade shows. In her spare time she enjoys hanging out with her English bulldog “Homer” , friends, and family. 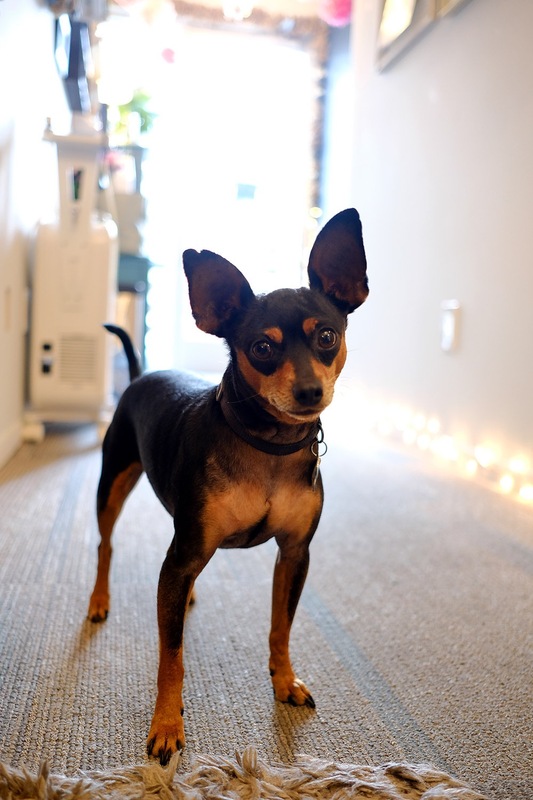 Frederick is a 6.5lb Miniature Pinscher and a valuable addition to the Face to Face Skincare & Massage staff. After losing his older brother to natural causes, Frederick decided to devote himself to the family business, making it is duty to properly welcome guests to Face to Face. He enjoys wagging his tail, sticking his tongue in guest’s noses when they let down their guard, and sleeping in his bed under the massage table. Frederick looks forward to greeting you at your next visit.